Well, ye socks, it's hard for yours truly to believe, but it's been seven whole months since the mighty Gators beat Oklahoma in the BCS title game. But, finally, the new season is coming into view. It can't come a moment too soon for the fans of the orange and blue. 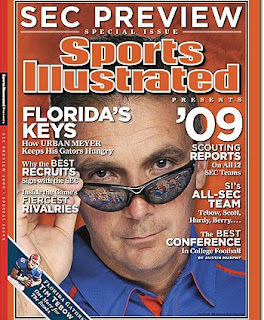 How can you not be Jonesing for some fun 'n gun after seeing the new Sports Illustrated SEC Preview special issue on the news stands this weekend?! Or, how can your adrenaline not kick into high gear with all the practice reports flowing out of Gainesville?! And, yet we still have to wait til September 5th for the real deal. Charleston Southern? I'm assuming they're coming down here from South Carolina? Or, maybe, it's West Virginia? Gator bait, either way . . .
No more cash for clunkers!